I began last week’s post with the story of a minor tragedy: a customer being forced to dump an IPA because it was so stale. That post discusses both what happens to beer as it ages and degrades, and how hard breweries work to slow the process. Nevertheless, we’ve all had the experience of buying stale beer. It raises some important questions. How does this happen? Whose fault is it? And the most important question of all: what can you do to avoid out-of-date, stale beer? To answer the hows and whos of stale beer, I decided to contact people responsible for each step in the chain—breweries, distributors, and retailers—to find out what they do to ensure freshness. This is a mostly invisible realm to the consumer, and it’s fascinating to learn what’s happening (or not) behind the scenes. Whether a brewery has tight controls over their brewhouse, their oxygen levels, or their bottling equipment, they should all date their bottles. This is a basic level of transparency. 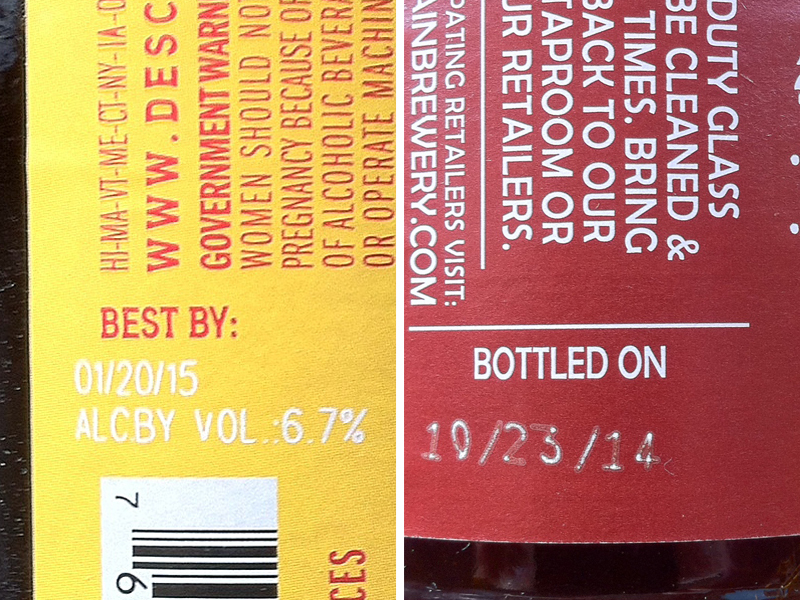 Some breweries use “best-by” dates, which is adequate, but even better are “bottled-on” dates. These let the customer see when the beer was made and make judgments about whether to buy a package. The step totally invisible to the consumer is distribution. In the American system, policy-makers decided to install a middle-man between the producer and retailer so that breweries didn’t build huge monopolies over pubs. The system accomplishes that end, but also adds a layer of handling that can slow things down. Folks I spoke to told me the practices of distributors vary widely—some are fastidious about making fresh products available, others not so much. I spoke to Jim Fick, Vice President at General Distributors in Oregon City, OR, to learn about the best practices among wholesalers. General distributes a number of local craft breweries, Coors, a handful of imports, along with cider and wine. Echoing what Edmunds said, Fick pointed out that the brewery/wholesaler relationship is key. “Around 60% of our volume is MillerCoors, and we get annual audits by them. They come through and do a ‘process audit’ (checking our operation out at our location) and a ‘field audit’”—looking for old beer on grocery shelves. General takes responsibility for the beer on grocery shelves. If beer is near being “out of code” (past its sell-by date), one of the distributors’ staff should be pulling the beer and replacing it with fresh beer. Pulled beer is sold to staff at General, sold at cost or below at dock sales, or destroyed, depending on how old it is. General has a staff of merchandisers whose sole responsibility is checking accounts, rotating products, and stocking shelves. Everyone I spoke to expressed anxiety about the retail landscape, which seems wild and uncontrollable to them. Fick, the distributor, gave an example of the kind of thing that can happen in a store that neither the brewery nor distributor can easily identify. “A real problem is a lack of back-room refrigeration at grocery store and convenience store chains (those 85-90 degree storage areas in August are a killer for beer), and also slow movers at retailers that have beers sitting out on a warm shelf for weeks and months.” Of all the people responsible for handling beer, retailers have the most influence over freshness, and often, the least sense that it’s important. To learn more, I spoke to Chris Ormand, who does the buying for specialty beer shop Belmont Station in Portland. Belmont stocks everything from beer down the street to across the continent and planet, and I’ve always gotten fresh products there. Because of that I figured Ormand would be able to explain how he keeps his beer from going stale. He began with a basic fact unknown to me. “The distributors have a responsibility to deliver beer ‘within code,’ and a legal requirement to accept returns within 10-14 days for any reason. Beyond that, I don’t believe they’re under any legal obligation to pick up stuff that goes out of code on a retailer’s shelf, so it falls on the retailer to keep tabs on their inventory.” This demonstrates a basic principle: breweries and distributors may be very involved pulling old beer, but it ultimately falls to the retailer. That was, I’m sad to report, a sentiment I heard from breweries and wholesalers, as well. When you’re buying beer, look for a date on the bottle. It’s good to see a “best by” date and better to see a “bottled on” date. – Look at the date on a bottle of beer. Breweries that don’t date their beer should expect customers to doubt whether they’re committed to delivering it fresh. There’s a handy online source that tracks this info called Fresh Beer Only. – When you’re in a store, look around to see if there are old products on the shelves (seasonal are a dead giveaway). If the retailer hasn’t gotten the old spring beers off the shelves by November, it’s a good bet they aren’t monitoring their beer. – If you do happen to buy an old beer from a store, let the staff know what you found. If they are responsive and immediately pull the product, it’s a good sign they are interested in fresh beer. If not, look for a different retailer. – Drink seasonally. Most large breweries have one slot reserved at a grocery store for their seasonal offerings (a seasonal “SKU”). They make sure that beer from the old seasonal is rotated out as the calendar changes. – Finally: buy beer straight from the brewery. It’s always the absolute best way to get fresh beer. There are now 3,000 breweries in the United States, and most consumers have at least one local brewery to patronize. One of the biggest barriers to getting fresh beer is the recognition that it’s a critical component of good beer. As beer fans, we cannot only be vigilant, but talk to breweries and retailers about our experiences, praising them when the beer is fresh, and alerting them when it’s not. The more people realize freshness is so important, the more they’ll make sure beer is fresh. I’ve duscussed this subject with a beer store owner I occasionally frequent and who insists outdated beer is OK. He stocks beers that have set on the shelf for even as long as five years! I will print your article and give it to him. I work for a beer distributor, and I was shocked to find out that our retailers rely completely on us to keep track of the dates of the beer on their shelves. In our state, the law says that retailers are responsible for selling the product (i.e. that retailers cannot force distributors to take back out-of-date product), but if we don’t take it back the retailers will allow old beer to stay on their shelves until it sells. I have seen beer that is literally years old in some independent liquor stores. It’s a little terrifying as a consumer. I hope that your articles will prompt consumers to put pressure on retailers to take on their share of the responsibility for fresh beer. A great way to keep your beer fresh longer is pasteurizing it. There are affordable smaller pasteurizer out there for Craft Brewers made by Pro Engineering that can really make the difference in shelf life. Also, packaging equipment for quicker turn around are available by Pro for the Craft Brewers. Check them out at the CBC in April in Portland, OR along with Breakside Brewery. Great Article, I have been looking for more articles like this. In my experience, pasteurization deadens beer flavor. I’d rather take my chances with unpasteurized beer and rely on date codes and other indicia to suggest freshness. To me, pasteurizing craft beer means taking the word craft out of the name. Point well and truly missed, then! Unless you live in Georgia and then you are out of luck. This needs to be changed. Hopefully the GA craft brewers guild will come through! Is there a list out there with the number of days between bottling and “best by” dates for the breweries that use a “best by” date instead of a “bottled on” date? This would be helpful information! Me too Tina! Not a beer drinker and need some stale beer to make a recipe! Guess we need to look for old beer at the store!